At the end of the 1990s this band still existed, and that's no mean feat. 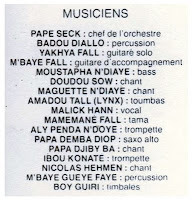 They started as the "22 Novembre Band" in the 1970s, and as such they were the Orchestre Federal (Federal Orchestra) of the prefecture de Kankan. I am sure the name refers to the attack led by Portugese soldiers on November 22, 1970. In Guinea, even today, it is simply known as "l'agression". The 22 Band was exceptional as a federal orchestra in that they managed to get three albums released on the Syliphone label. Strangely these albums have not been re-released as such, only some tracks have appeared on collections. If you like, I will post the lp's later. * the photos were taken by Rob Lokin in Kankan in 1999. 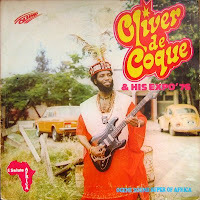 I have referred to the subject before, but it's a pity that some of the great artists of Africa only generate 'global' interest -and sometimes even recognition- after they have performed with a western ensemble or have had a record produced by a western producer. One of these great artists (and maybe he is even a Great Artist) is Gnonnas Pedro, of Africando fame - until he died in 2004. You can read more about him in this interesting post on the "With Comb and Razor" blog. And while you're at it, don't forget to download the last track (or all of the tracks) of the album posted there. 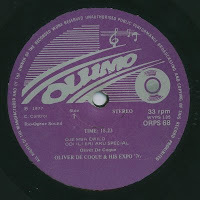 Here is an lp from (I suspect) 1980. The A-side of the album features tracks which have at some point been released on CD (the two Ledoux compilations). 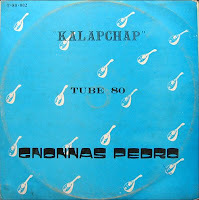 Side B features just one track, "Kalapchap". 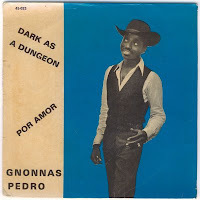 As a bonus I add this wonderful single, with an earlier version of "Dark As A Dungeon" (than the one you just downloaded from Comb & Razor), by Gnonnas and his Panchos de Cotonou. 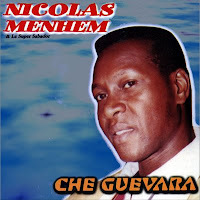 A slightly different version -than on the CD "Live At El Rey"- of "Marehwarehwa", with some great dancing by both Thomas Mapfumo and the backing chorus. Unfortunately cut in three (because of the length). This is the first of a series of posts about a partnership that played a critical role in the development of African music, and more particularly Zimbabwean music: Jonah Sithole and Thomas Mapfumo. 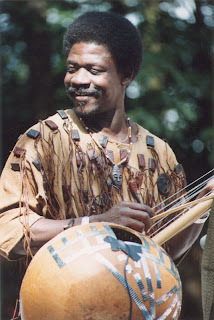 In this first part the focus is on Jonah Sithole, the man who 'invented' the mbira style guitar playing. Here are excerpts of an interview with Jonah, recorded March 16, 1996 in Amsterdam. Jonah passed away in Zimbabwe a year later. The other musician present is the -unfortunately also late- Alan Mwale. Between the excerpts are 'related' tracks. A zip combining the 8 tracks cab be found here. 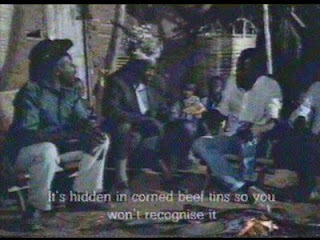 By the way: here you can find another version of "Moyo Wangu", with an explanation by Mukanya himself. And here is an interview by Banning Eyre with Jonah Sithole. PS: The links have been renewed on August 18, 2012. 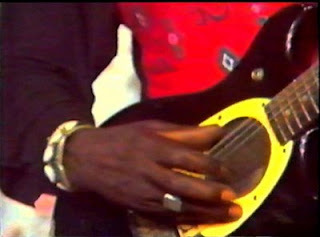 I am not sure about the name of the track in this video from Malian television. 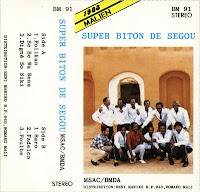 In Guinea the track is mostly called "Were Were", but in Mali bands tend to favour names like "Ah N'Dianamo". Besides Salif Keita and Manfila Kanté (lead guitar) you may recognize the rhythm guitar player, Amadou Bagayoko (of Amadou & Mariam*, formerly known as "Le Couple Aveugle"). And I would like to draw your attention to the trumpet player, Tagus Traoré, who has not only played with Les Ambassadeurs, but also with Le Nimba Jazz and a range of other orchestras in Guinea, as well as playing with Ernesto Djédjé in Abidjan (and who now lives in the Netherlands). * It seems a huge injustice that they have got their own wikipedia page and Les Ambassadeurs don't. 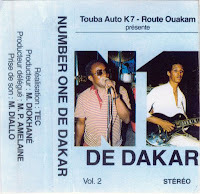 Most, if not all, of these tracks have been released on CD and I still prefer the cassettes from Touba Auto K7. Especially these from Number One de Dakar. 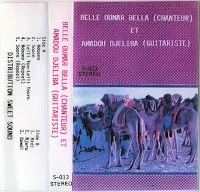 Here is a list of the other musicians playing, and here's the second volume of these wonderful Touba Auto cassettes of Number One. 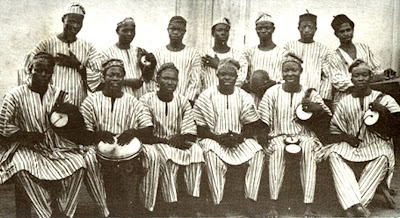 The late Alhadji Haruna Ishola is sitting in the middle (third from the right). This is the top of the league, as far as apala music goes. 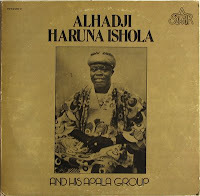 And within Haruna Ishola's extensive line of albums this is one of my favorites. This is a unique clip from a tv show on Zairean television called "Tonton Skol". 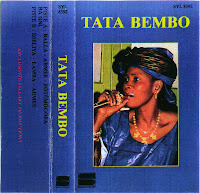 It features singers Carlito Lassan (at the time probably still with the TP OK Jazz) and Dindo 'La Voix Cassée' Yogo (either still with Langa Langa Stars or with Zaiko Langa Langa) in a track composed by Tabu Ley Rochereau when he was singing alongside Kabasele in the African Jazz orchestra. 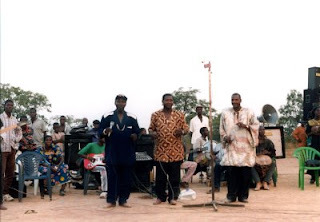 The orchestra accompanying this impromptu duo is Mbonda Africa of Johnny Bokelo (standing on the right playing guitar). I have always been a fan of Carlito, ever since tracks like 'Maya', 'Affaire Kitikwala", "Bon Samaritain" and "Sisi"*. And Dindo Yogo has popped up regularly as someone I should take more notice of. Both have disappeared now from the limelight. Dindo Yogo, because he passed away in 2000. And Carlito, because he is now known as Frère Carlito, i.e. -as too many Congolese artists- he has found religion. There is more information about Dindo Yogo in this great article by Martin Sinnock. *If you don't know these tracks, let me know and I'll post them. To really enjoy the full effect of the bala you have to go to West Africa. Preferably on a warm, humid night, with the sound of cicadas filling the background. 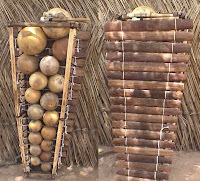 When the bala player (or balafo) really gets going the gourds will start to hum - and the spirits will awake. As I said, you'll have to go there yourself to experience this. Don't take my word. I hate to disappoint you, but this cassette doesn't produce the same effect. But if anyone can get close it's Molobali Keita*. He's from the Sikasso region of Mali, and one of those artists that are at risk of remaining anonymous in the West (like Karamoko Keita). He has produced a string of cassettes (neatly numbered), and I can recommend any of those, or all if you can find them (and if you do, let me know!). There are a few wonderful clips (here and here) on YouTube, if you want to see the master at work. And here is the fourth volume of the series. 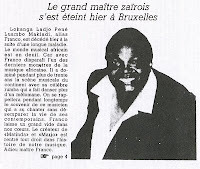 A key track in the oeuvre of Franco is the 1974 song "Kinzonzi Kitata Mbenda*". 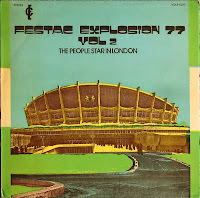 Composed and recorded in a time when Mobutu was at the height of his power. In an attempt to create his own version of a négritude movement he had 'africanised' Congo into Zaïre, and had ordained that all culture must comply with the standards of Authenticité. It was a time of intellectual challenges. 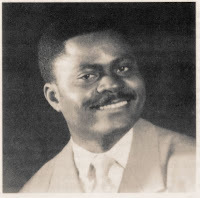 In the OK Jazz these were met by Lutumba Simaro's poetic masterpieces "Ebale Ya Zaïre" and "Mabele". 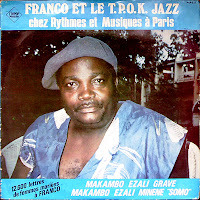 Franco, ever the man of the common Congolese, complied with the song "Kinzonzi Kitata Mbenda". 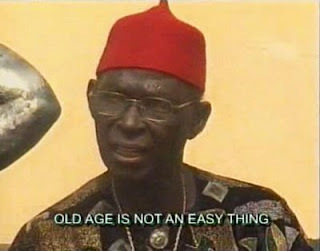 It means this: the elders, when you go to a family meeting (palabre) you have to get the young involved, so that the young listen and see what you are doing. Because that's the way the tradition is learned. You shouldn't say to a child "do this, do that". No, your child, you should invite him to the family meeting. And now, the child sees and listens, and it teaches him, doesn't it. And he grows up with that and he grows up with that maturity. There's no school where you can take children to learn tradition. There isn't one. That's what Franco wants to say in this song. So the school of tradition is to involve children, even the youngest, in the family meeting. They listen, they see what happens, and in the long run, they grow up, up, up, - and he too now he can give... Voilà - there is a discussion in the family, and the child, he also can cut in, because he will continue what the elders have done. Because tradition doesn't change. It's all that has been said and all that will continue, like. That's the way it moves on. You shouldn't go to school to go and learn tradition. The lark can't say to his child: "look, we're going to do this". No, he takes off and says to his child "follow me". The child follows and sees what his mother is doing, how she lands, and he goes "ah...". So, life is like that. So Franco - all that, that's what he was singing. Do you know why? Because Franco, he followed his mother. To every family meeting. For example there is this song which was sung.. For example, now you and Stefan have a dispute. And this dispute has taken enormous proportions. And to talk about it you have invited people to sit down and sort it out. Now, when they come there is an old man who wants to give you an advice. And instead of talking to you he wants to sing you a song. For example, Gerard is wrong and you are right, and instead of only saying to Gerard "you are wrong", I will use a song. "Gerard, you shouldn't give the wrong which you have to Stefan (you shouldn't blame S. for your error). Accept that you're wrong and take it unflinchingly". Instead of sáying that he will sing a song. [sings a line from Kinzonzi Kitata Mbenda] So, Gerard, don't give your wrong to Stefan, accept that you were wrong and the problem will be resolved. So this song existed before this old men was born, before you too would be born. Do you see? Because he went to the family meetings - which gave him this experience - instead of saying "we'll do this, we'll do that. Shut up [? unintelligible]. No not that!" Well-mannered, he only sings one song, and you understand "ah, but yes, this old man is right...."
I have tried to stick to the French, so you can follow Ntesa's words. 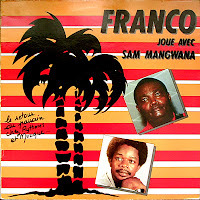 The track is in Kikongo, the language of Franco's mother. It can be heard here. * it is very likely that the title was misspelled on the album. According to Congolese sources it should be "Kinzonzi Ki Tata Mbemba" ("the palabre of Papa Mbemba"). 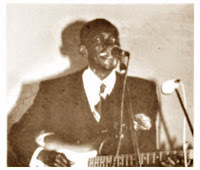 "Lukoki" was recorded in Brussels in the week before Christmas with only a few musicians of the TP OK Jazz: Dizzy Mandjeku (second lead guitar), Mpudi Decca (bass) and Bosuma Dessoin (conga). Here is a clip of this final masterpiece, sung in Kikongo, - with photos from the concert a month later in Amsterdam. Alternatively here is the audio track. 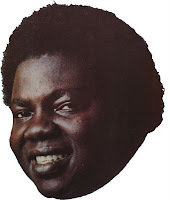 Today I would like to dedicate a few posts to the memory of one of Africa's Greatests: Franco Luambo Makiadi. Exactly 19 years have passed since Franco passed away in a hospital in Namur, Belgium (and not in Brussels as the article on the right states). It didn't come as a great surprise to us who had seen him three weeks before in the Melkweg. A shadow of his former self, even compared to the thin figure we had seen in January. It hurt to see a man we had come to love and admire battle with his own mortality (and even when I write this I am reliving the pain of that night). 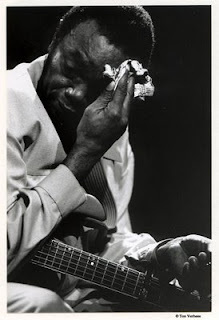 In retrospect it is said that he predicted his own death, in "Kimpa Kisangameni", recorded and released in 1983. 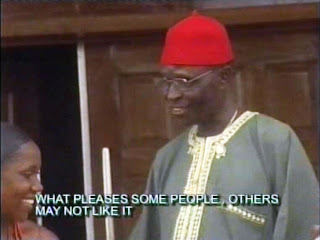 Ntesa Dalienst (who unfortunately is also no longer with us) explained to us the meaning behind the words. Ntesa's explanation (in French) can be heard at the end of this YouTube clip. He asks his mother to open her eyes. The sorcerer is entering into the family to eliminate everyone. Bavon Marie Marie has gone, if mother doesn't take care they'll all go, and you will be left. And who is going to bury you? That's what Franco was saying to his mother. So: "Kimpa Kisangameni".... so, "sorcery has entered into the family / there are people that want to hurt us / Mama, open your eyes / if not, you will be left on earth, with no sons to bury you". And unfortunately that's what has happened: Bavon Marie Marie is gone and Franco too has gone and Mama was left behind. Here is the audio (and stereo) version of Kimpa Kisangameni, taken from the lp "Chez Rythmes et Musiques à Paris" (Edipop POP 032). This is a clip from the documentary 'Spirits of Defiance' which has really stuck in my mind. It's not about music, but about culture; and to be more precise about perception. The director/producer has brilliantly succeeded in portraying the point of view of the Mangbetu, who used to be cannibals. This clip is about sorcery, a subject familiar to anyone who has ever wandered off the tourist path in Africa. And it offers a refreshing look on western religion. This videoclip by Ibrahim Hamma Dicko is more than a tune with moving pictures. It offers some insight into the negotiations that are a central part of a traditional marriage proposal in Mali. Ibrahim is sometimes compared to (the late) Ali Farka Touré, but this is plain rubbish. Ali had a far more profound knowledge of the diverse traditions of Mali's Northern regions. 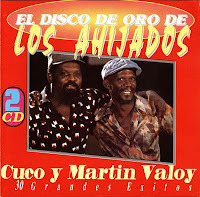 Cuco Valoy started his extensive musical career with his brother Martin. The duo went by the name of Los Ahijados, which can mean "the godsons" or "the foster sons". This must be a reference to the legendary Cuban son duo Los Compadres, who they considered to be their musical padres. 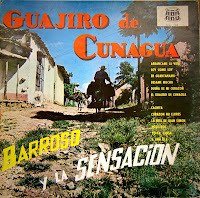 Cuco later set off on a slightly different road, with his band Los Virtuosos and later La Tribu. 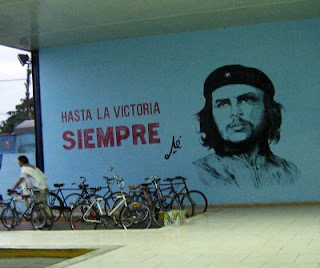 Lately he is better known in his native Dominican Republic as the father of Ramón Orlando (one of his fourteen sons). Maybe I am looking in the wrong place, but the albums of Los Ahijados appear to be very hard to find. That's a pity, as I am sure you will agree after listening to this wonderful double album. 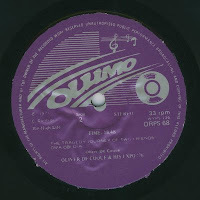 It's filled with the unique Ahijados mix of son and merengue. As an added bonus this album contains some brilliant tracks featuring an organ. My (most) favorite tracks are 'Dos Almas' (Two souls) (which I only knew as a kind of chachacha by Sonora Matancera) and 'Solito Con Las Estrellas' (Alone with the stars). In case you are wondering: I have plenty more in store this weekend. So I want to get this one out of the way (so to speak). 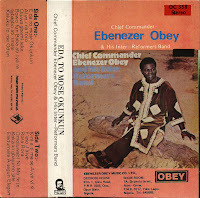 I was inspired not just by a request after the post of the second volume, but also by the post on Highlife Haven of another great Osadebe album and the posting of some older tracks on Likembe. Keep it coming, folks! I will certainly post some more in the future. 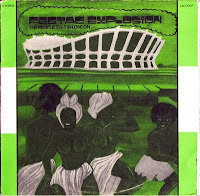 Here is Festac Explosion Vol.1. EDIT December 28, 2010: I've uploaded the file to another server. EDIT May 2, 2013: I've uploaded an improved version to yet another server!! 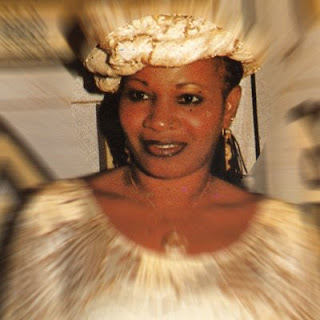 Elenga Zacharie, better known as Jhimmy, was one of the founding fathers of modern Congolese music. 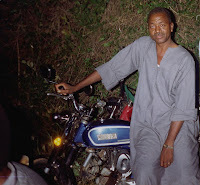 Coming from what is now known as the Central African Republic, he came to Leopoldville to work as a shorthand typist with the Solbena trading firm of the Benatar brothers. 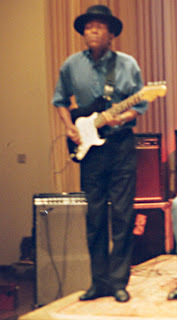 When the Benatar brothers started the Opika record label, Jhimmy started his career as guitariste. His stage name was taken from American country legend Jimmy Rodgers. His first hit was a track called "Ondruwe" which co-starred his Angolan friend Mwanga Paul, who also composed the track "Henriette" on the other side of the record. When others -like Kabasele, Goby, Déchaud and Taumani- came to the Opika label and became 'stars', Jhimmy faded into the background. Here are four tracks recorded in April 1951. 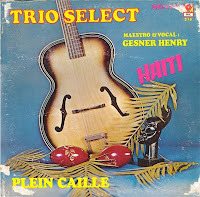 The group accompanying Jhimmy was called the Cuban Jazz orchestre. 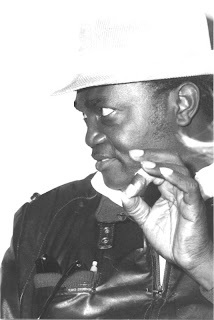 The main vocalist is Mwanga Paul. 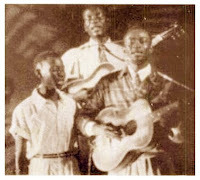 I have added two tracks from 1952, of a slightly better quality, with some lovely plucking from Jhimmy and Mwanga Paul crooning away. My favorite is "Likambo Te", which I am told translates as "there is no problem"...... Very true. 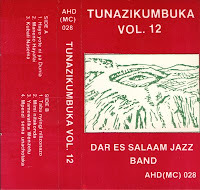 I don't know anything about this cassette by the Dar Es Salaam Jazz Band, apart from what I can hear. And that's enough to post it. 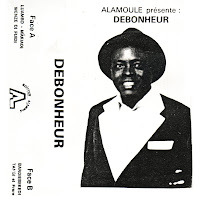 This very enjoyable cassette contains a great version of Franco's Course Au Pouvoir. If anyone has more info about this band, please let me know. ''Orchestra Makassy, the brainchild of Mzee Makassy himself, has taken audiences all over East Africa by storm. 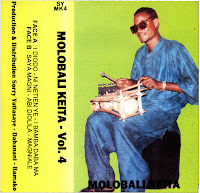 Their blend of pure Kiswahili and Zairois rhythms have captured the hearts of music lovers who have constantly demanded this set of Makassy's greatest hits. The popularity of the group has not come without its share of disappointments and it has entailed great work from Mzee Makassy. 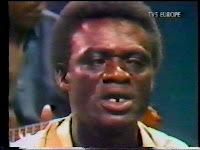 The group would perhaps have been a household name sooner had it not been for the unexpected and tragic knifing of the lead singer Isiak Baharia, alias Gobby. This sad event caused great turmoil but from the ashes of the former group Mzee Makassy moulded his present band with the considerable help of Rammy Ongara and Fan Fan from OK Jazz. 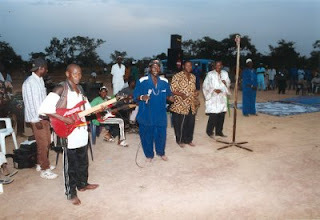 These were then supplemented with Aimala Mbutu, Simaroo on Solo guitar, Kadesi on Bass, Batty on Rhythm and Adam Seye on Trumpet (also formerly with OK Jazz) amongst the others in the group. Thus the Orchestra Makassy, whose emblem of the elephant and drum has become famous in such a short space of time, has brought some of the finest musicians together from the brink of disaster to the top of the charts. 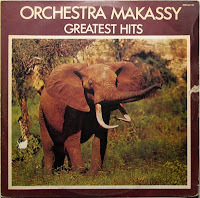 Here now are Makassy's greatest hits - the first set of many from this fine band." "Rammy Ongara"? Remmy and Adam Seye in the OK Jazz? Who has this man been talking too? Anyway, here is this great 1981 album from Orchestra Makassy. EDIT March 29, 2012: I've 'refreshed' the link (yet again). It is sad to see African artists rising to fame solely because a western producer thinks he has found a 'star'. And it is even sadder to see that, just because these artists have 'made it' (or are perceived to have made it) in Europe, the States and/or Japan, they rise to stardom in their own country, - where nobody wanted to know them before. By contrast, there are many artists whose songs have been deeply rooted into the memories of vast amount of Africans, but who will always be considered as being too 'local' for global distribution. One of these is 'Tasidoni' Karamoko Keita. BIG in Bamako in the eighties. Children were singing his tunes. I don't know where he is today. But his music shouldn't be forgotten. 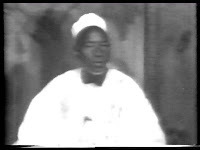 Here is a video from Malian television, and this time in full colour.